The Exterior Signage Guidelines were approved by the Chancellor in August 2003. The Task Force developed the guidelines at a general level. This gives planners a framework within which to design. The guidelines cannot, however, anticipate every situation; signage placement and details will need to be determined by an experienced eye, and there may be occasions when exceptions are necessary. These guidelines provide a general framework within which exterior signage is to be specified and positioned for actual installation. In each case the proposed sign will be considered by the Building and Grounds Committee, through a site plan provided by Facilities Planning. Upon the recommendation of Facilities Planning the Committee may adopt reasonable variances from these guidelines. 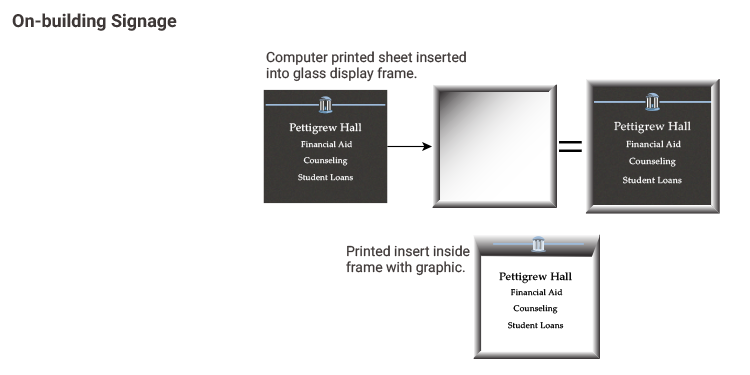 Facilities Planning will maintain a set of specifications and a designated supplier for each of the allowable types of campus signage. Graphic: The Old Well intersected by a Carolina Blue line. 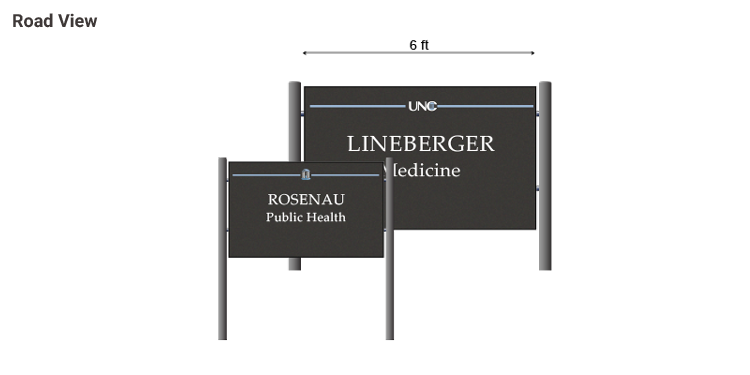 For School of Medicine sites that offer patient care the Health Care logo (letters UNC with stylized Old Well) may be substituted for The Old Well, and for intercollegiate athletic sites the Interlocking NC may be substituted for The Old Well. Exact scale and dimensions will be refined by a graphic designer with signage experience. Road view signs are those that would normally be read from a passing automobile, and contain the name of a building or area. Road view signs may also include the building address or directions. Free-standing signs viewable from an automobile on a street or road. Use of 4 foot and 6 foot road view signs is determined by which street they are on. View the attached map for specifications. In Master Plan Precinct 3 (Health Affairs) road view signs may, upon the approval of Building and Grounds, be lighted. The design of such lighted signs will conform to the graphic signage standards with the addition of internally-illuminated lettering. 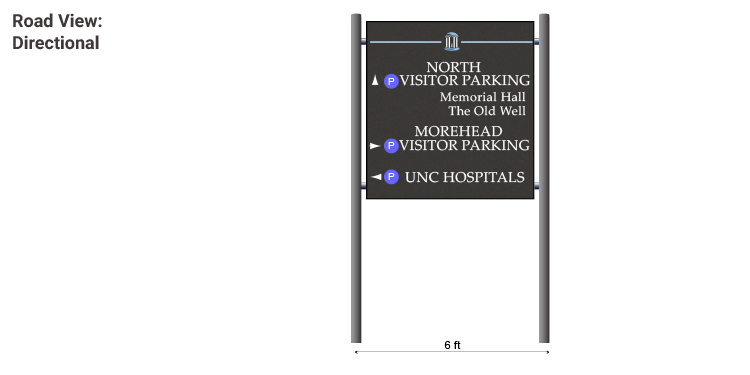 Public Safety and UNC Hospitals Emergency Room may add an additional lighted graphic with the approval of Buildings and Grounds. 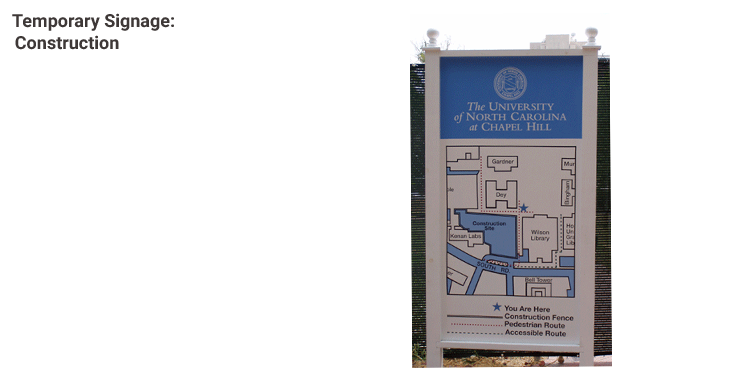 Directional road view signs will point to parking lots for principal destinations, such as Undergraduate Admissions, The Old Well, Memorial Hall and UNC Hospitals. Such a sign might list destinations accompanied by an arrow; or it might contain a very large scale map. The parking symbol (blue circle with white capital P) will be used on directional road view signs. 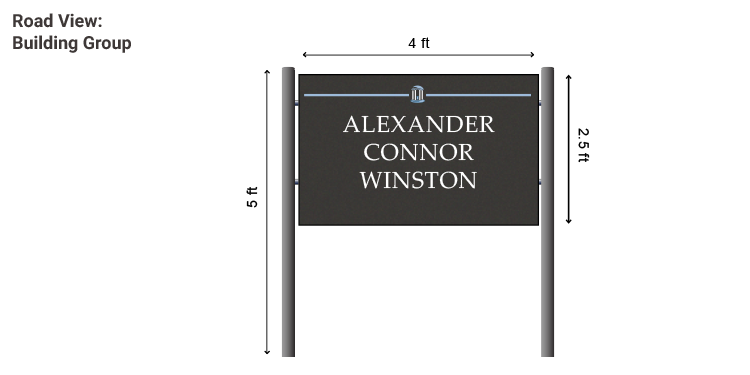 A road view sign for a cluster of buildings may contain the names of more than one building, such as in a grouping of residence halls. Pedestrian view signs are free-standing signs that would normally be read by a pedestrian, and would be oriented accordingly, with smaller lettering than road view signs. There are two types: single pole, and lighted display case. The sign would contain the name of the site or facility, and may also have the name of the school or the broad academic division (“Academic Affairs”); those that are service-oriented may have the names of the primary services offered. Free-standing signs viewable by a pedestrian. Sign will consist of a panel approximately 30” x 19” mounted on a single pole with crossbar. Pedestrian view signs contain the name of the site or facility. Buildings that are primarily academic may have the name of the school or “Arts & Sciences”, and those that are primarily service-oriented may have the names of the primary services offered. Event-oriented facilities may install a featured event display case, lighted, in a style consistent with the signage graphic identity. 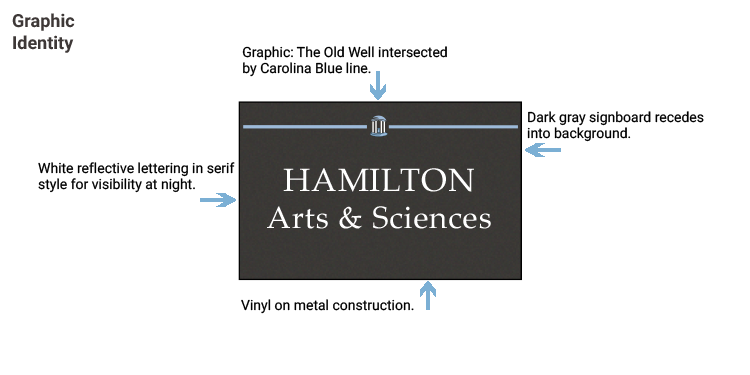 Such facilities include Hill Hall, The Ackland Art Museum, Memorial Hall, Paul Green Theater, Carolina Union and perhaps Playmakers’ Repertory Theatre. 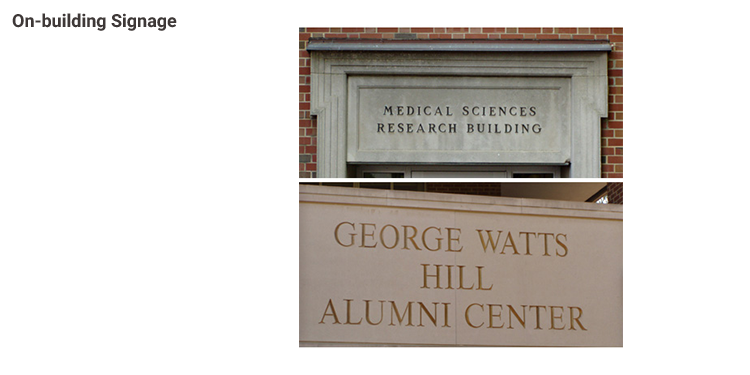 The two principal types of on-building signage are building names rendered architecturally, and entryway plaques indicating what may be reached through a particular entry. Historical plaques, a third type discussed in its own section (see links at left), may also be placed on buildings in accordance with the University’s historical marker policy. Building name will be at or near the principal entrance. Prismatic metal lettering will be standard; engraved lettering may be used where appropriate. Facilities Planning staff will prepare a menu of specifications for typestyles, sizes, colors and materials. A plaque conforming to the same standards. Historical information may be placed on a building in accordance with the Historical Signage Policy. Note: It is the sense of the committee that any signage for visually-impaired persons, such as a Braille plaque beside a door, should be developed through a separate process. The present system of signage may be used in parking lots for the name of the lot, and for any regulatory signage relating to parking spaces. Building and directional information will use the new signage standards. Over time Transportation and Parking may migrate to a signage system that uses its current scale and content but otherwise conforms to the new signage standards. Visitor lots will be provided with map tables or other suitable tools for wayfinding. Black vinyl Palatino Linotype lettering on white substrate, regular signage graphic at top of sign. It is the department’s responsibility to ensure that the signage policy is followed, that the contents are appropriate, that it is well-maintained, and that it is taken down promptly. Note: Student and commercial signage policy is described by the Facilities Use Policy of the University. Building banners may not be used in lieu of the permanent signage described in this policy. Note: Student and commercial signage policy is described by the Facilities Use Policy of the University. A department in a building facing onto a street may install street banners on utility poles bordering the building. The department is responsible for the content, maintenance and timely removal of the banners. All such installations require the permission of the pole owner. Note: Student and commercial signage policy is described by the Facilities Use Policy of the University. Facilities Planning and Design is responsible for the design, installation, maintenance and removal of all construction signage. Whenever practicable the Project Description Sign will include a map with pedestrian and vehicular routing through and around the project. On-building and free-standing historical signage will be recommended to Buildings and Grounds by the Historic Preservation section of Facilities Planning. 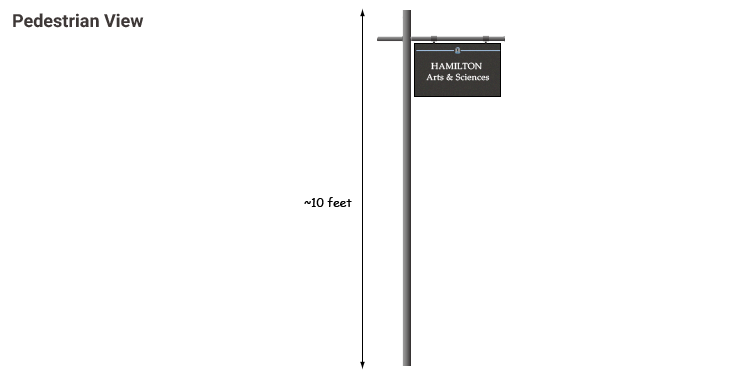 White, light-reflective lettering on a dark background, with a simple graphic accent, provides the ideal balance between visibility and fit with the campus. By having a relatively small number of elements it is possible to render the sign at various scales, and then to adjust individual elements--such as type thickness--as necessary, while keeping the overall consistency. Because of varying road speeds and building sizes, the basic road view sign is either 4 or 6 feet wide, depending on the particular street. Directional roadview signs will point to parking lots for principal destinations such as The Old Well, and not to The Old Well itself. There would then be a map at the parking area that would guide the viewer to The Old Well. A road view sign for a cluster of buildings may contain the names of more than one building. 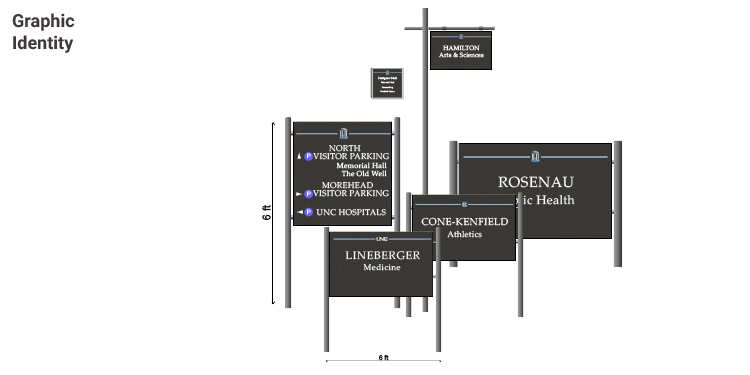 The single pole design allows signs to be placed in a variety of locations. Normally, there are no more than one per building in the area of the main entrance. 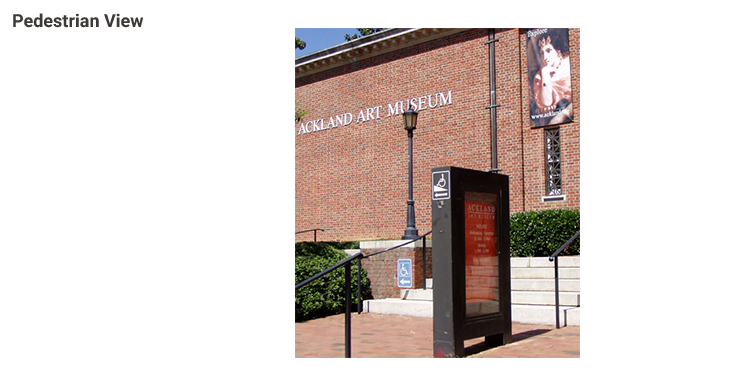 The lighted display case would be used at event-oriented facilities such as The Ackland Art Museum. The pictured case would be modified so that it is consistent with the signage graphic identity. Prismatic metal lettering is the standard, while engraved lettering may be used where architecturally appropriate. Free-standing signs (pedestrian view or road view) are limited to one per building. Architecturally appropriate entry plaques, consistent with the signage graphic standard may be used. Facilities Planning and Construction is responsible for the design, installation, maintenance and removal of all construction signage. Whenever practicable the Project Description Sign will include a map with pedestrian and vehicular routing through and around the project.